Your Wedding, Your DJ and so much more. An open look for upcoming Brides and Brides to be. Keep up with the latest wedding trends. Peek in and see what previous brides choose for music, decor, timeline and more.We are a customized and personally oriented DJ service. We are so much more than just music at your reception! MB Entertainment there is a difference! It was absolutely awesome afternoon and evening, at the very beautiful Southernmost Beach Resort, in Key West Florida. Upon arrival we met with Melissa Shaffer, catering director of the property. The staff was extremely helpful in pointing out the setup or MB Entertainment in our equipment. The wedding took place on the beach and the view was absolutely breathtaking. The Southernmost staff cleared the beach as well as the passage across the area for the entire evening, it was like having a private beach in Key West all to yourself. The set up as pictured was for approximately 80 guests. Prelude music included steel drums, and right before the wedding party Jack Johnson's "Better Together"
Cocktail hour immediately followed this wedding party and family went for pictures. Cocktail Hour Music: Caribbean music - the kind of music to run your toes in the sand. Key West Cigar Club and Smoke Shop was hired and rolled cigars from cocktail hour through the end of dinner. The introductions followed as we introduced both sets of parents, the entire wedding party, and our guests of honor. The dinner was Buffet style with a Caribbean/Latin flair. There was Paella, roasted pork, grilled fish, grilled chicken, steamed veggies and black beans. As all outdoors and Southernmost put forth a beautiful display. Musical highlights of the evening included a special dedication to Anthony's stepdad, it was his birthday, and they had a specialty cake made just for him. Just before the newlyweds cake cutting, the beginning "In da Club" by 50 Cent where it says "It's your Birthday" was looped, I followed with "Birthday" by the Beatles and he blew out his candles. It was then time for the newlyweds to cut the cake. This was destined to be absolutely smashing! The song they selected was "Hit me with your best shot" by Pat Benetar, I guess you can figure out what happened next! Throughout the night everybody dance to a lot of the old school type music sprinkled with some of today's top songs. All in all the wedding was an absolute success thanks to Melissa and her staff at Southernmost. Thank you for all your help! NOTE: During setup I had the pleasure of meeting wedding specialists, Carolyn Guarini of We've Got the Keys ( http://wevegotthekeys.com ) planning services. It was a GREAT NIGHT Under the Stars in Key West! The third event in 24-hours! 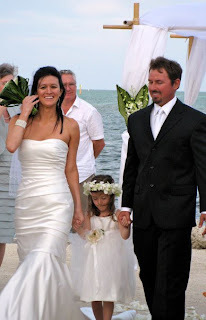 This was a big one of the weekend, Billy and Michelle's wedding at the Marriott Beachside Resort in Key West. 350+ attendees, included a who's who of Key West elite, including sports celebrities, cheerleaders past and present, and the owner of the Marriott Beachside Resort! The doors were scheduled to open at 9:15 PM to allow the guests to find their seats. The doors opened as scheduled, the guests entered to an upbeat version of "Satin Doll" from the Bobby Morganstein collection (thank you Bobby), this is probably the best version of this song. Then at 9:30 PM we played a montage of video on the Marriott's huge 15 foot screen, it included pictures of both Billy and Michelle growing up, and their relationship once they met. It even included a personal message from gator quarterback Tim Tebow! Then it was time for the introductions. Wedding party over 20 came into Lady Gaga's "Just Dance" and then the stars of the show Michelle and Billy, they came into the University of Florida Gator fight song! Then we went right into the first dance. This party was set up for dinner with stations around the room and two bars one inside and one in the lobby. There was a photo booth for guests to take pictures for memory book. This party kicked off in the very beginning! When dance music was played immediately following the first dance and we didn't stop until 2 AM! A full hour of overtime and a full dance floor! MB Entertainment does it again! We will talk to you at the next blog... BIZ BASH is coming up!!! This past weekend started Friday night April 23, with an awesome wedding at Coconut Cove resort in Islamorada. Steel drums filled the air as Bob Lyons played the prelude and the ceremony. Bob also played through cocktail hour. MB Entertainment and yours truly took over as cocktail hour was winding up. Kim and Mike's cocktail hour had a true tropical feel, including selections by Jimmy Cliff, Bob Marley,Jimmy Buffet, and Jason Mraz. Dance party and dance music selections were everything from old-school hip-hop to the latest From Lady Gaga. Paul and Magda always put their clients first, and this is what makes Coconut Cove Resort one of the top destination wedding locations in the world. Just did a walkthrough for tonight's wedding and reception at Vizcaya. This venue never ceases to impress, with its breathtaking view and incredible architecture. The wedding ceremony will take place at the Casino Mound, with the cocktail reception to follow on the terrace. The dinner and dancing will be moved inside due to the temperature dipping into the 40's. I am looking forward to "Rockin' Vizcaya hard tonight!" Talk to you all tomorrow! I am Mike Berrios - I'm proud to say I am the owner of MB Entertainment. MB Entertainment is a mobile DJ company made up of the top DJs and MC in the business. MB Entertainment provide services for all types of events specializing in weddings.